I'm a big fan of the original Star Wars trilogy, especially, and I love the opportunity to make projects that go with these films. If you look back in my archives, you'll find a few things I've made in the past. This year for my brother's birthday, I made him a mini quilt featuring the Death Star made with English paper piecing. When I saw the pattern, I knew I HAD to make it. With life and other deadlines creeping in, the project took me a bit longer than I expected. Thankfully my brother waited (no so) patiently. Also thankfully, some lovely folks on Instagram helped me gather the many gray fabrics I needed to put this thing together. It's all those fabric and the little details that make this special. I had the mouse fabric in my stash, and I thought it would be fun to have that little guy on there. 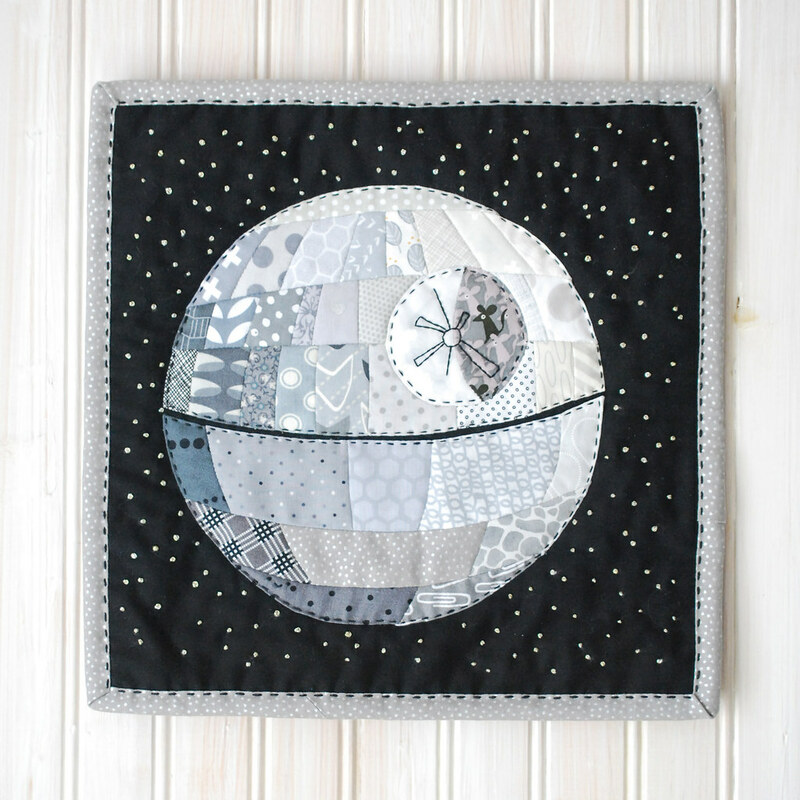 The embroidery on that section of the Death Star is all by hand, but then, pretty much everything on here is by hand. 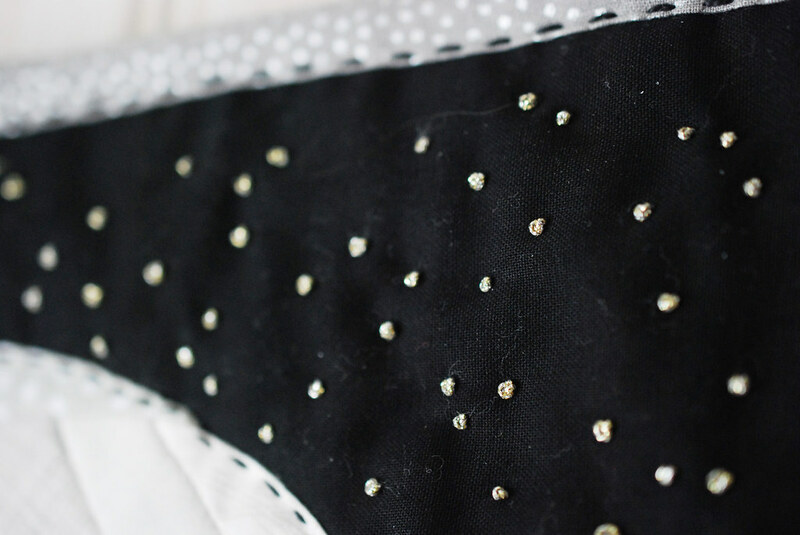 Hand stitched piecing, hand embroidery, hand applique, and hand finishing on the binding. 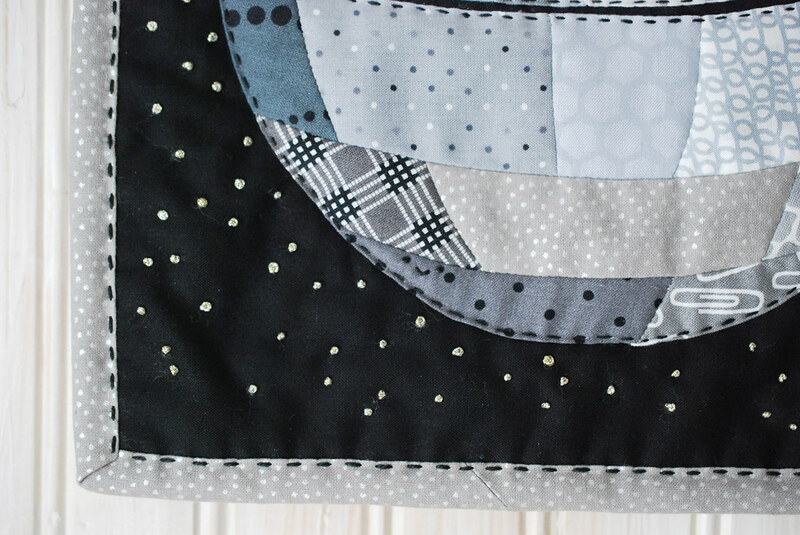 The only thing done on the sewing machine was attaching the binding strip to the mini quilt. The "stars" were all done with metallic thread french knots. I'm not sure what the thread brand is (I got it on clearance and there was only a price sticker on it), but I'll tell ya...it was great thread! Instead of being twisted, it was woven, and I think that made all the difference. My only regret is that I stitched them through the front and batting (but not the backing fabric). When I pulled the thread through, it pulled some of the batting fibers, and the fuzz will not go away. Still, I like the quilted look it has. You'll also notice that I added a little face...it's sort of how I sign my work now. 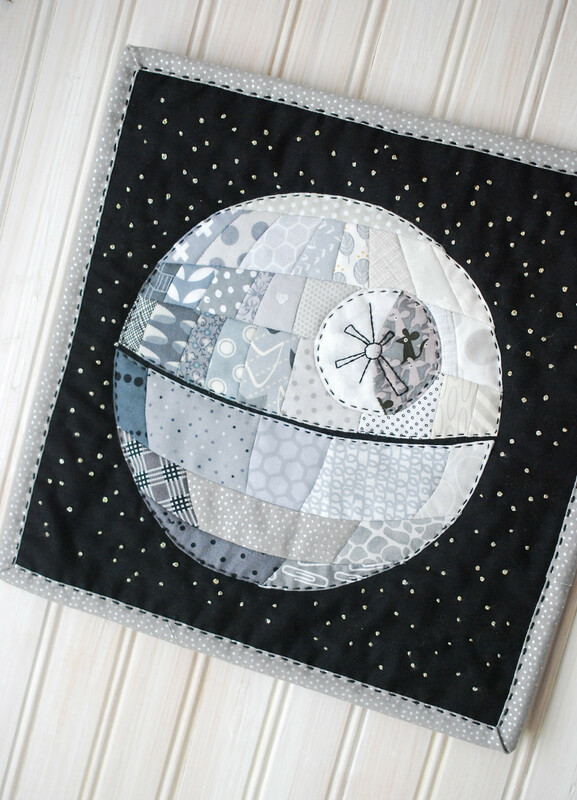 The original pattern for this has you create an upper and lower background piece that gets joined to the Death Star itself so that the entire piece is English paper piecing. 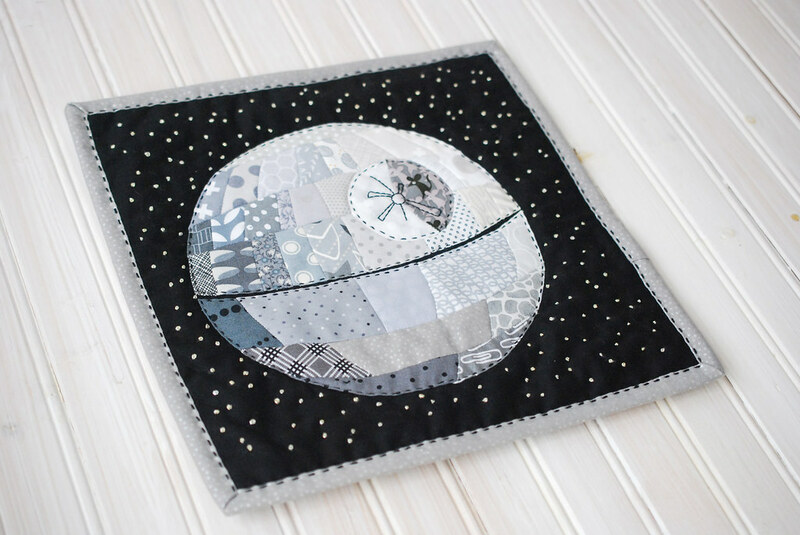 I opted to applique the Death Star onto my backing fabric. I'm not sure that it was any easier (I had to make sure all little flaps of fabric were tucked under), but I do like the look. This was a big project, but it was also so much fun. And I'll tell you what...I'd make it again in a heartbeat. Is there a bigger compliment for a pattern? Oh, and my brother like the gift! Even better! 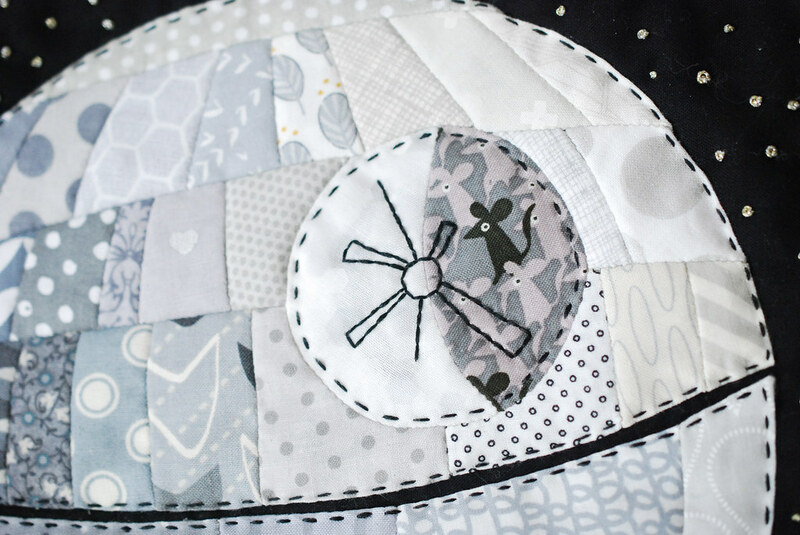 Find the free pattern for the Patchwork Death Star on Quirky Granola Girl's Blog. The mouse fabric is perfect! This looks so cool. I love all things planets/stars related so I love it. This is so much fun! Showed my husband, who is a big SW fan, and he loved it too. Well done! I LOVE this. I was so excited to see it, thinking I would make it for my son or grandson. But then I saw it was all handwork, which I can't do anymore due to a significant tremor. So sad! I think you did a wonderful job on it. I'm really impressed. If you've ever done foundation paper piecing on a sewing machine, I think you would be able to use this pattern for that too. Never seen Star Wars. But this Quilt ist GREAT!! Wonderfull and Interesting. Thanks!!! This quilt is great. Did you print the same size as what was in the pattern? Also how large in the background? Thanks!! I think I printed the pattern at 100%, but it's been a while, so I can't say for sure. The background is 12"x12"